veganmofo 18: Enchiladas | Go Fork Go! I have a confession: I’ve totally made these before so they’re not new. But I’ve run out of things to talk about. i’ve been so busy with work (I’m working in a different town) that my lunch everyday has been veggies, crackers and hummus. Yeah, fascinating. I cheated and used canned enchilada sauce. Sorry, lame, I know, but I’ve never worked with chiles before and decided that I would totally butcher it if I had to use them. For that matter, I’m not sure I’d know how to buy them… hmph. 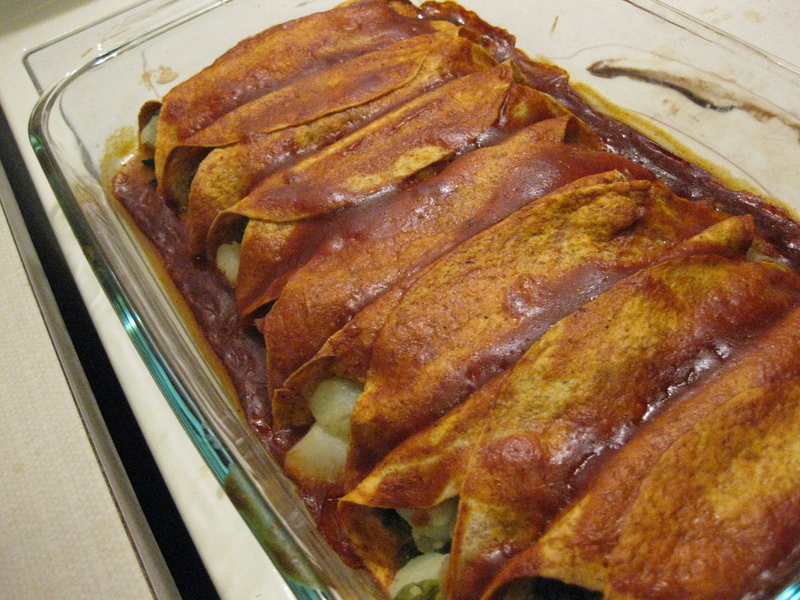 Other than that… the filling loosely follows the enchiladas recipe from veganomicon. Except I used spinach instead of kale because I’ve never had kale before and I like spinach. I love spinach. ← veganmofo 17: What Do You Do With Leftover Bagels?